As we’ve all seen and heard, the Tsarnaev trial has been chock full of horrifying testimony and agonizing, gut-wrenching stories. It’s been a difficult trial to follow and the testimony regarding MIT Officer Collier’s murder was no different when it resounded throughout the courtroom. On April 18, 2013, Collier was found in his police cruiser with multiple gunshot wounds to the head. He lay dying as his blood pooled around him. Ultimately, medics could not save Officer Collier and on April 8, 2015, Jahar Tsarnaev was found guilty of taking his life. 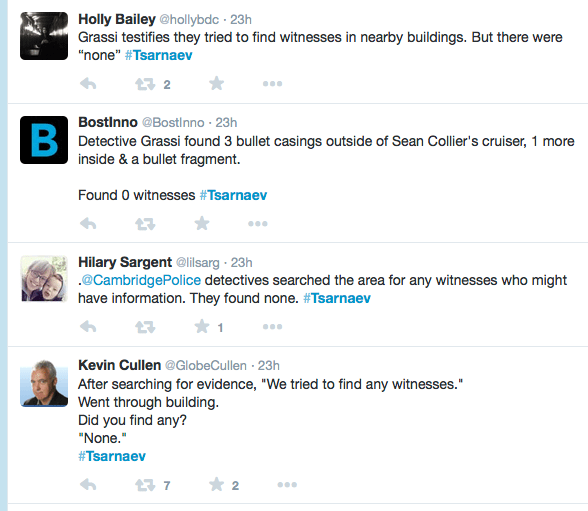 So how many witnesses did they have from that night? Right, zero. But in October, 2013, Watertown Chief Ed Deveau spoke at the Clinton School of Public Service and had something very different to say. “Harman’s interest was piqued the next day when he saw a news article about the murder. “Once I knew it was on that corner, at around that time, then the memory sparked,” Harman told The Tech. “I had seen this person leaning into the car,” he said. Having made the connection, Harman realized what an unlikely position he was in and conveyed his shock to his friends. So who is this mystery witness that left the MIT campus after witnessing Officer Sean Collier’s murder, headed to Watertown and then apparently called the Watertown police? No worries. We won’t get any answers. Don’t even think about dwelling on this. This is important friends Copy and paste this post and SHARE THIS Thanks to Lena Circassian All except the bag location he is right on the mark.Thanks to Peekay who has backed off the fake victims story now that he’s had time to see the truth clearer. All except the bag location he is right on the mark. We have leverage now that they have shown their hand in court All we have to do is all of us send one email with our proofs of innocent to the AG and that should start the ball rolling Holders gone so we have a chance if everyone unites under one roof.